Not Yo’ Mama’s Banana Pudding! In the South, banana pudding is a staple, one I was never really fond of until recently. As the name states, this is not your normal banana pudding recipe. This is rich, creamy, delicious and best of all, requires NO COOKING! 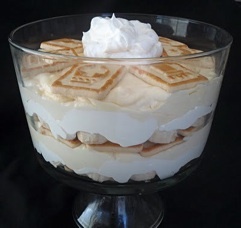 Line the bottom of a 13×9 by 2” deep dish with 1 bag of cookies and layer bananas on top (or you can get “fancy” with a trifle bowl like the pic). In a bowl, combine the milk and pudding mix and blend well with a handheld electric mixer. Using another bowl, combine the cream cheese and condensed milk and mix until smooth. Fold the whipped topping into the cream cheese mixture. Add the cream cheese mixture to the pudding mix and stir until well blended. Pour the mixture over the cookies and bananas and cover with remaining bag of cookies. Refrigerate until ready to serve. This entry was posted in Dessert and tagged banana, banana pudding, chessmen, french vanilla, pudding, trifle by quarlj01. Bookmark the permalink.